I can't believe that my little girl has started year two at school. I don't know where the time has gone. The summer has passed in a blur of activity and fun with the usual measure of stress thrown in to keep things interesting. This summer we had a number of hospital appointments and the dreaded care plan review to contend with without the support and guidance of a key worker. 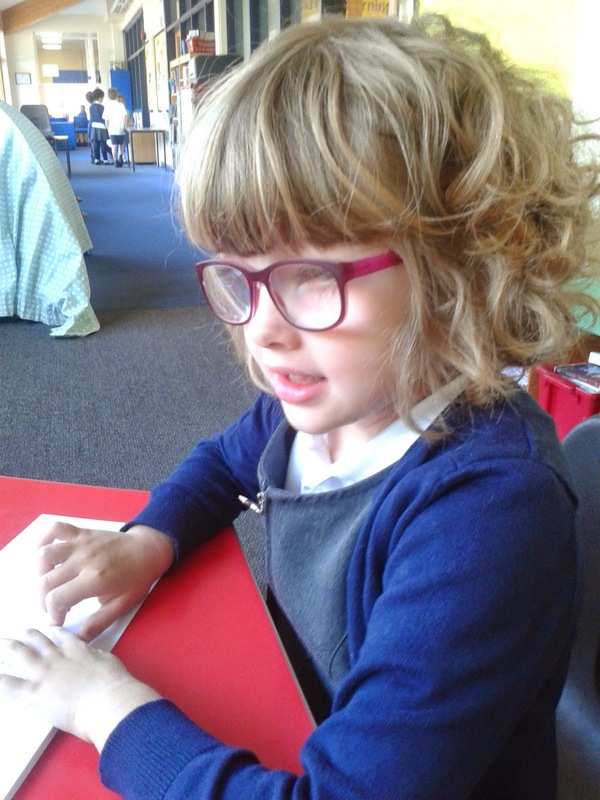 One of the outcomes of our visit to the eye clinic is that we are trying glasses again because though they cannot correct her overall eye condition they could help her focus using the tiny bit of peripheral vision she has. In the past glasses have proved a big issue as the sides have rubbed on sensitive scar tissue, her processors have been pushed off her ears and they seemed to make her less stable on her feet. Last year after being prescribed new glasses she was bumping into objects in her class room and at home and she kept taking them off and posting them into small spaces until they mysteriously disappeared. As we sat in the clinic after seeing a new optician who recommended trying them again I admit I had my doubts and rebellion was rising in my heart. The last time we tried was so stressful for all of us. My instinct is to be good and do as the professionals recommend, after all they are the experts, but their text book theory does not always prove to be right for every child and Chloe is just so unique. This time being good might just have paid off. 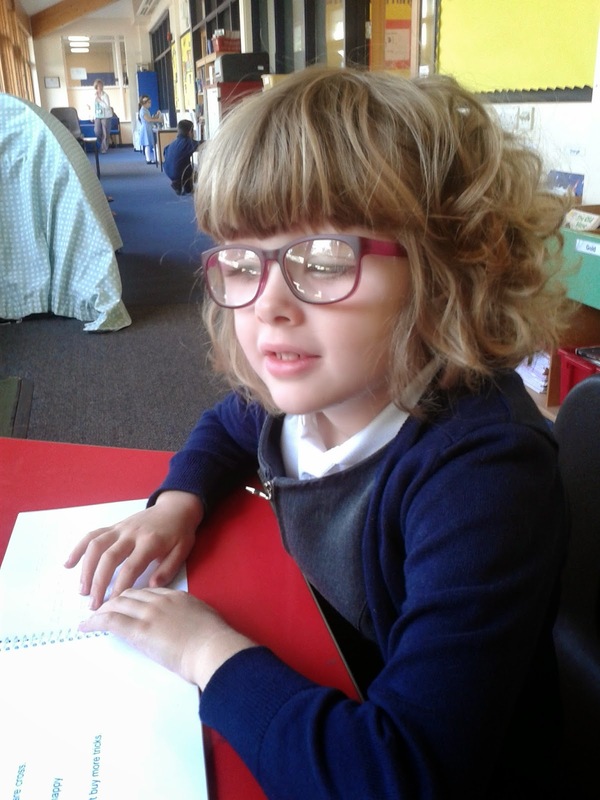 The dispensing optician took lots of time with Chloe, They made sure the frames were large enough so her eyes won't wonder above or below them, they fitted the sides so they won't slip or rub and best of all Chloe found frames she really likes. We collected the new glasses on Saturday and so far so good.They make her eyes wobbly when she tries to watch the ipad or television but she is managing to wear them with no accidents at school . They fit really well and Chloe can put them on herself. One of the things I love about Chloe is how willing she is to give things a go. I held the memories of the frustrations and difficulties we had previously and tried not to articulate them to Chloe. She wants to please people and responds well when professionals take the time to explain things to her in language she understands and with energy and enthusiasm. She is determined and with everyone around her saying how gorgeous her new glasses are perhaps this pair will not do a vanishing act. If they do perhaps it will be time to take note of what Chloe is trying to tell us. As we walked through the play ground last night a fellow pupil asked whether Chloe could see now she has glasses. How I wish with all my heart they had that power. 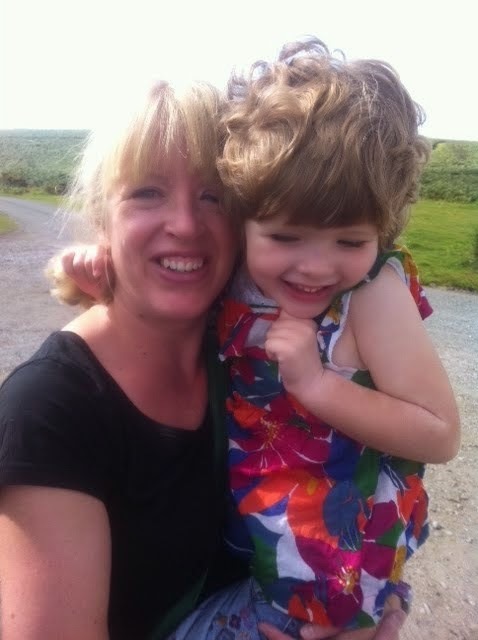 The cochlear implants give Chloe really good access to sound but she is still profoundly deaf. No magic eye doctor can make her rods and cones work properly, There is no surgery or treatment available but the glasses seem to help a little and that is a huge consolation prize. Thank you Sarah. I know she will go far, nothing seems to faze her. I am often in awe, such a lucky Mum. Please do Rachel, I would love to set that up. I could do with some Braille practice so it would be good for both Chloe and I. Do you have a facebook or twitter account so I can private message you? I have a page for this blog and my twitter name is eyesearsheart.